ROCK 'n ROLL has served with the G. I. Joe team since its inception and has been constantly updating his equipment and skills. 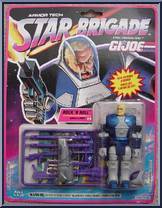 When he heard DUKE was recruiting members for the Star Brigade force, Rock 'n Roll jumped at the chance to fight in space and be outfitted with the latest battle-armor technology. 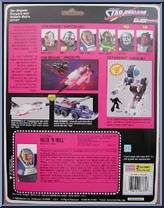 No other Star Brigade member uses his bio-integrated, Robotic Battle Armor quite like Rock 'n Roll. He braves laser fire, jumps on live grenades, and even chases Cobra B.A.T. 's right into the sun to capture them (and to toast an occasional marshmallow on the end of his laser rifle). Contribute pictures, update details or suggest corrections for Rock 'N Roll. Write a review about Rock 'N Roll.